New Delhi is known for historic sites, parks, shopping, museums, and fun & games. Your plan includes some of its best attractions: take in nature's colorful creations at Humayun's Tomb, contemplate in the serene atmosphere at Akshardham, steep yourself in history at Gurudwara Bangla Sahib, and indulge in some culinary diversions at a local gastronomic tour. 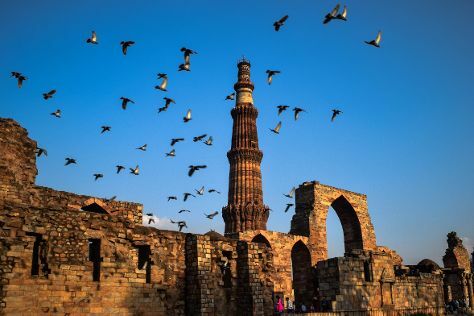 Plan trip to New Delhi with our itinerary maker to find out where to go and what to do. Use the Route module to find travel options from your starting location to New Delhi. Expect a daytime high around 43°C in April, and nighttime lows around 25°C. Wrap up your sightseeing on the 29th (Mon) early enough to drive to Agra. Kick off your visit on the 30th (Tue): make a trip to Tomb of Itimad-ud-Daulah, admire the landmark architecture of Jahangir Mahal, and then explore the historical opulence of Agra Fort. On your second day here, tour in style with a train tour. To find more things to do, photos, reviews, and more tourist information, use the Agra trip planning app . Traveling by car from New Delhi to Agra takes 3 hours. Alternatively, you can take a train; or take a bus. April in Agra sees daily highs of 44°C and lows of 24°C at night. Wrap up your sightseeing by early afternoon on the 2nd (Thu) to allow enough time to drive back home.